Everyone in the field of online marketing, and beyond, has heard of the latest update from Google, codenamed Penguin. This isn’t actually an algorithm update but rather a filter that will be run occasionally. When it was introduced last month, it caused chaos in the SERPs and that chaos has still not subsided. As an example, let’s take a look at one of the most competitive niches in SEO – payday loans. A first page ranking for “payday loans” and related phrases can bring in thousands of dollars per day. So there is a lot of dubious activity surrounding these sites, primarily in terms of backlink building. Additionally, it’s the kind of thing that many people will want to test on other sites before exposing their own money sites. 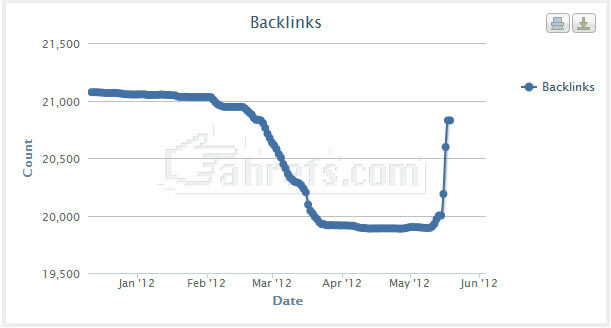 For example, they will try their newest backlink schemes on a totally unrelated site that they don’t even own. If that site ranks for the term, they monitor how long it stays up there and what else Google does with it. With that kind of knowledge they have a better understanding of how to approach ranking their own sites for the big money phrases. Right now, when I search for “payday loans,” I get the results above. Notice anything strange? There are two magazine sites on the first page of results! Completely unrelated sites. And the site int he #10 spot looks pretty new, given the lack of data shown in the SEOmoz stats. Clearly, there are some very aggressive linking practices going on here and the magazine sites seem to be being used as test sites. Let’s take a look a bit deeper. This is the backlink report for KiwiMagOnline.com. It’s clear that the site was recently hit with a massive amount of links. Assuming that ahrefs found only a fraction of the live links, and it’s showing about 1,000 new links in the past couple days, it seems safe to say that a large link blast will rank a completely unrelated site – at least, for a brief period of time. But kinds of links will have this effect? Some quick Googling reveals that the site got a lot of backlinks from hacked sites. Take a look at the source code above, taken from a perfectly innocent looking website. In the header, someone inserted a few links to URLs that are completely unrelated to their anchor text. The links are in a div with the “display:none” property, meaning the browser won’t show them. But a search spider will still read and count them as backlinks. Did I mention this is on a PR6 site? The header is sitewide, so from a PR6 site it’s safe to say there were some high PR inner pages as well. This is taken from site-connect.net, one of those sites that generate statistics about any domain. Looks like their crawler determined that the title of the site is, “PayDay Loans online – No Fax Needed” and pulled in a fitting meta description as well. That’s not what I see in my browser when I go to the site. Interesting, no? A large amount of anchor text backlinks from high authority sites, even if they’re in a hidden div, will rank a completely unrelated site for a highly competitive search phrase. Don’t let @MattCutts or @RandFish tell you otherwise. One of my sites was victim to one of these hacks! Apparently dozens of Payday loan links were hidden until I pulled the site up on my mobile. I don’t know what changed perhaps the shift in the template or the browser being used was responsible for revealing them but thank goodness I found them. I’m confident I removed them and the code that was hidden in the functions but how do you know what if any long term damage is done to the site. I mean locally in the files and/or SERPs? Unfortunately, this is still a widespread issue. That’s why it’s important to monitor your site and occasionally check for errant code. It’s great that you caught it – like you said, it was probably the different template that revealed the links to you, depending on how they were hidden. If you’re sure you removed all of the offending links, any SERP damage you may have had will likely dissipate over time. As your site gets crawled and as long as it remains free of those hacked links, it should be fine. I’d recommend boosting your security settings, if possible. Or at least removing write access from users who don’t need it.